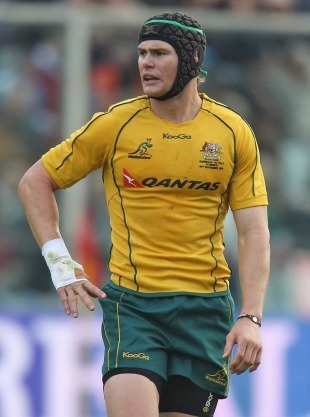 Wallabies playmaker Berrick Barnes insists he is fighting fit for the forthcoming Rugby World Cup. The 25-year-old Waratahs star's career appeared to be in the balance earlier this year as the result of a succession of concussion-related medical setbacks but he has battled back to fitness to claim a place in coach Robbie Deans' 30-man squad for the sport's showpiece event. Barnes was selected as Quade Cooper's back-up at No.10 and will also target involvement in midfield and possibly even fullback after satisfying Deans, medical staff - and himself - that concussion problems which prompted him to quit the latter stages of the Waratahs' Super Rugby campaign are resolved. When a disorientated Barnes retreated from the Highlanders at the Sydney Football Stadium in June his prospects of participating at a second World Cup appeared remote. Despite wearing headgear he was still blighted by what was eventually diagnosed as footballers' migraine. Barnes took a month off and consulted expert opinion on how he could address the dizziness and headaches. He was fairly non-specific yesterday when asked about the secret to his recovery, labelling the variety of remedies as "weird and wacky". However, time spent with former Waratahs assistant coach Scott Wisemantel and strength and conditioning expert Peter Roberts at Lennox Head on the northern NSW coast was influential. "The guys up there, I owe them a lot. They worked me hard and since then I haven't had any symptoms." Barnes modified his diet, indulged in meditation and was prescribed intensive weight training. The acid test for the 31-cap utility was a return to the field through club rugby and after one game his confidence was restored. Barnes took some punishment but was never knocked out of kilter during four outings for Sydney University. "I felt right going into that first game and after a couple more you put any doubts away," he said after the 30-man squad was revealed. Barnes said he was grateful for the faith the Wallabies selectors had shown in him and was anxious to start repaying that trust when he plays for the Australian Barbarians against Canada next Friday. Considering his medical history Barnes realised he would be a target when Wallabies' Cup campaign opens against Italy on September 11. "No doubt they'll send cattle my way, but they send cattle at anyone that stands at 10, so I won't be surprised if they're coming down that channel at whoever's there. I've just got to trust what I've done off the field is going to be enough to get me through on it. I've got no issues about defence." Barnes told Deans three weeks ago he was available for selection and the coach was confident his former vice-captain was up to the rigours of test football. "You can see it in his eyes. You can see it in the way he's playing the game and enjoying the game now," Deans said. Barnes main priority was reacquainting himself with the Wallabies playbook having not featuring in a test since last year's European tour. "I've been out of the system here for a while. I haven't been in the squad or training with them, but I don't think too much has changed from years gone by," he said.